Simon Ammann is the gangly Harry Potter type who against all expectations pulled off the feat of the Salt Lake Games at the age of just 20 before melting back into relative obscurity. The Swiss kid with the electronic engineer look drew gasps of breathe from the public when storming to a rare double on large and normal hill double gold in the ski jumping. That made him a national hero and the first athlete to complete this double since Finland's Matti Nykanen in 1988 at Calgary. If one considers the competition Amman was facing, it only adds to his achievement: the favourite Germany's Sven Hannawald had just won the Four Hills tournament and Poland's Adam Malysz was also on top form. 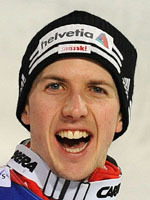 Ammann began ski jumping at the age of 11 and swiftly showed a competence with only his rather frail build and lack of strength, a worry. He had made a modest and discreet Olympic debut at the tender age of 16 at Nagano and a year later he managed 26th place in the 1999 world championships large hill. Prior to Salt Lake, the man who took the plane home carrying two thirds of his nation's gold haul had been an unknown, and for a while it seemed the whole thing had to be put down to an inexplicable flash in the pan. At Turin for example, four years after his Olympian achievement in the US, Ammann's eagerly awaited propensity to spring a surprise never materialised and his crushingly poor 38th position in the small hill saw him simply pull out of the large hill event. The odd-bod farmer's son put his mercurial form down to the fact he spent more time in the college library than zipping down dare-devil jumping ramps. At Japan the following year, Amman treated fans at the Sapporo World Cup to a blast from the past soaring to a gold medal in the large hill and a silver in the small, a season in which a very promising World Cup campaign pitched him up to third overall. Still only 27 by the time the Czech Republic played host to the 2009 world championships, Amman took a bronze medal in the normal hill and also edged up to take second overall in the World cup with consistent appearances on the circuit's podium. So eight years after his American dream he may well just leave his rivals whistling Dixie again as the Games are staged in the Rockies outside Vancouver.